The support of die-hard voters who previously supported the governing Justice and Development Party (AK Party) has dropped to less than 20 percent. This is the claim being made by Temel Karamollaoglu, the chairman of the Islamist Felicity Party (SP). Islamist SP, along with the main opposition Republican People’s Party (CHP) and nationalist opposition Good Party (lYI Party), formed the Nation Alliance to rival People’s Alliance, Erdogan’s electoral coalition with the Nationalist Movement Party (MHP), in the local elections on March 31. Karamollaoglu also said the upcoming local elections might be realigning, referring to the decline in die-hard voters of the governing AK Party, which has been in power for 17 years. “People desire to see a change in Turkish politics. People [who have never voted for us] started to favor us [SP] as a result of this desire. Among these people are social democrats and nationalists. But most of them are former die-hard AK Party voters,” he explained. “Just before the June 24 general election, AK Party’s share of die-hard voters dropped to 22,5 percent [in the surveys]. I think now it is less than 20 percent. AK party members are worried local election results might shock them. And they blame us [SP] for it,” Karamollaoglu said. The opposition leader further said Erdogan and AK Party members have launched a smear campaign against his party. 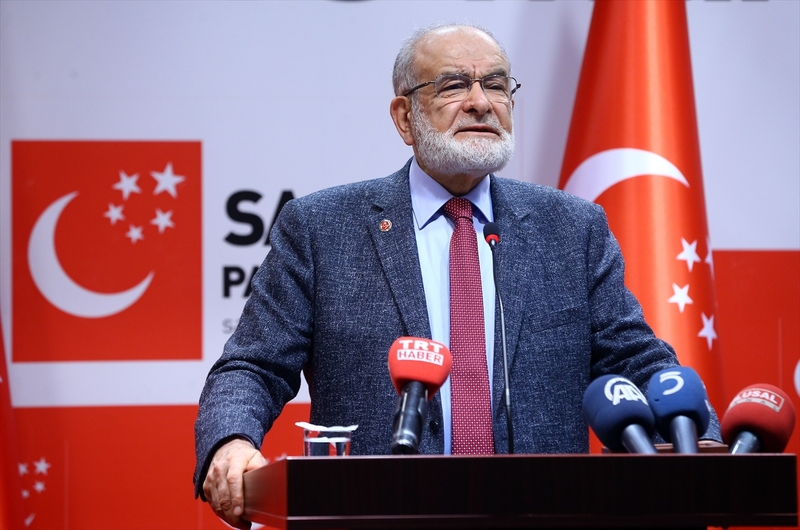 A member of SP was detained on Sunday, after he reacted to terror accusations of Suleyman Soylu, Turkey’s Interior Minister, targeting the party and its leader Karamollaoglu. Soylu accused Karamollaoglu of aligning with the pro-Kurdish Peoples’ Democratic Party (HDP), saying he “threw Turkey under the bus,” when he joined the Nation Alliance, formed by four opposition parties to rival pro-government People’s Alliance, during general elections on June 24, 2018. Erdogan and his cronies’ political discourse equates HDP with the outlawed Kurdistan Workers’ Party (PKK), which has waged an armed insurgency in southeastern Turkey for decades.